The longer Dan and I have been married, the more we’ve discovered how truly introverted we both are—and how busy we are (or choose to be). Unfortunately, we’re quick to cancel our plans for date night: we plan on dinner out to catch up about work or school and just life, but instead we find ourselves at home just watching the same show and eating popcorn… with no conversation. And while those nights aren’t bad (and honestly sometimes a huge break and really enjoyable for us), we’ve really dropped the ball on setting aside intentional time to get out of the house and talk to one another. We began working on intentional conversations with Marriage365 Connecting Questions for Couples, and it’s been great (read my post on it here! ), but we wanted to continue to take our marriage in the right direction for us. That’s when I started thinking out of the box. Enter DateBox: a planned date night that arrives right at our door every month. I had been eyeing a couple different date night subscription boxes, but DateBox stood out from the rest. Its personalized questionnaire for the couple. Before shipping your date, DateBox asks that you complete its online questionnaire with your partner so your date can be tailored to your interests. I also want to point out that other date night subscription boxes do not offer date night out options, but DateBox does! How does it work? Well, your DateBox arrives and you are sent on a date out and the tab is covered entirely—you simply bring the voucher codes included in your box! The only reason we haven’t utilized this option is because we live in a small town. Around the fifteenth of the month, our date arrived, and I couldn’t contain my excitement. I found myself staring at the cutest packaging ever and I was dying to open it…but I waited until Dan got home from work! We decided together when we would have our date night—and it was so much fun! I believe the DateBox intended the date to last 1-2 hours, but we made ours last about three and a half hours because we were enjoying it so much! Okay, so I only took photos of the unpacking of our date—our date night was mostly private with only a couple instagram stories! And, we were just enjoying it so I honestly didn’t even grab the camera! First in our DateBox was a card titled ‘What’s included’ outlining everything our included in our date to make cake pops and to paint! There was also a card that told us what we would need, too (such as a mixing bowl, an oven, etc.). Next was a little booklet titled ‘Welcome to your date’ guiding us through our date night! 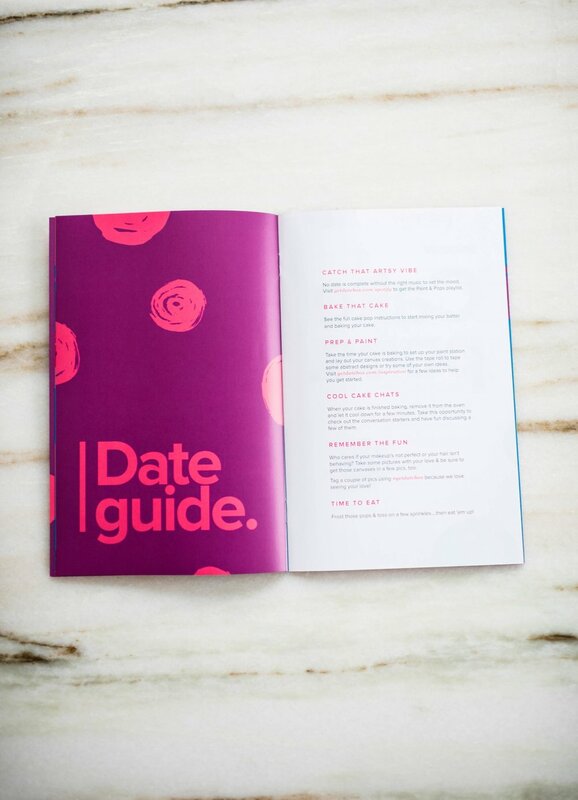 Our date was made so easy because it was outlined on one of the first pages—the Date guide! Oh, & have fun with it all—laugh, take photos, and tag #getdatebox on social media! I was a little hesitant about the playlist on Spotify—Dan and I just have very specific tastes! And I really wasn’t looking forward to mainstream music… But honestly, the playlist was tasteful. And calming. And enjoyable. It wasn’t overly romantic, or catchy, or (thank god) annoying. I was afraid of those things, but it was truly enjoyable! We played it a few different times that night actually, because our date night was much longer! We started the playlist—and really enjoyed it! While the cake was baking, we painted on the canvases! Dan painted some geometric shapes and I attempted painting some still life…a vase and flowers on my table…mine was so bad!! And Dan kept mixing up some of the most beautiful colors! We didn't use any of the washi tape provided in the DateBox. While the cake was cooling, we talked through the conversation questions (I’m so sorry guys! !—I don’t have them with me! But I remember they were questions like ‘What is something I’ve never told you before?’ and ‘What is something you really enjoy about your partner?’) And I told Dan something I thought I’d never tell him that was so embarrassing! When the cake was ready, we didn’t stop painting—we were just having fun, and talking about just about anything! It was great! We even shaped the cake pops and put them in the fridge for another half and hour and continued painting the entire time! Finally, when we were done painting, we clean up and frosted the cake pops and added sprinkles. I ate two (I’m not a huge sweets person), and Dan ate more. I know that we both had a really great time, but what I didn't expect was how much enjoyment Dan got out of it. Earlier this year, I went to an art studio and painted one evening, and it was incredibly relaxing. And I think Dan discovered that during our date. That night, we talked about me going to Hobby Lobby in the future and keeping an eye out for painting supplies for him! But more than anything, DateBox gave us an opportunity to reconnect and have fun doing it—and we’re ready for next month’s date already! Digital only ($7.99/mo.) - dates are digital and are sent right to your inbox! They are just as creative and fun, only you get your own supplies for your date. One Month Subscription ($39.99/mo.) - this is a fantastic option if you want to give DateBox a try without a longterm commitment. This is what we did! Three Month Subscription ($36.99/mo billed at $110.97 every three months) - I like to think of this as the happy medium! Six Month Subscription ($32.99/mo. billed at $197.94 every six months) - Honestly, Dan and I are talking about simply upgrading to this subscription already! If you’re still unsure about DateBox, here’s $10 off your first month. Really. Just click the link and go to the subscription. That’s a free month of the digital date if you simply want to give it a try! If you’ve tried DateBox, I want to know what you think about it! Let me know in the comments below or message me directly! Or, as always, feel free to ask any questions!